A facelift is a financial and time investment with a return on investment (a youthful and refreshed appearance) that can be enjoyed for years. According to statistics from the American Society of Plastic Surgeons (ASPS), the national average cost of a facelift is $6,652. 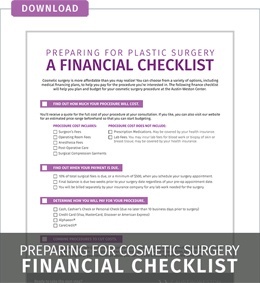 However, it’s important to note that this cost does not factor in other procedures commonly performed at the time of facelifts, such as eyelid or around-the-mouth surgery. It also does not include common surgery-related expenses or geographic location, and these can vary dramatically. Generally, the major variables that affect total cost are adjunct procedures, the surgeon's experience, surgical facility fees and surgery-related expenses. The overall cost of a facelift can range from $8,000 to $20,000 depending on the number of additional procedures requested. Keep in mind that rejuvenation of the face is different for each patient since often more than one area may be involved in order to get the best results. The cost of a facelift will vary widely per patient, so it’s essential to make sure you are comparing apples to apples. More importantly, make sure you are looking at the costs in the right light. Remember, this is your face; you want the best care possible, not the least expensive. The word ‘facelift’ means different things to different people, and some surgeons define a facelift differently than others. The words ‘facial rejuvenation’ are more appropriately used to describe surgery to make the face more youthful. This might include just lifting the cheek, the neck, or around the eyes. Similarly, it might include all those areas as well as lifting the mouth, chin, and brow. The surgical procedure must be tailored to the desires of each patient as an individual. A typical facelift procedure involves lifting of the cheeks, including tightening of the top muscle layer, to improve and prolong the results. Patients who choose to attain complete facial rejuvenation often combine additional procedures, which can increase the total cost; however, performing multiple procedures during a single anesthetic is cheaper than doing each procedure separately. It’s safe to say that cost can greatly influence why a patient chooses to have a procedure done by one surgeon over another. All surgeons have their own approach to performing facelift surgery as each doctor has different amenities at their disposal and different levels of experience and accreditations. At Austin-Weston, our four board-certified plastic surgeons have accumulated a combined 75 years of experience, and with that have cultivated an excellent reputation in the DC Metropolitan Area, performing more facelift surgeries than any other procedure. Each surgery is preceded by an extensive consultation involving computer analysis and imaging technology, as well as the master-eye of our surgeons to ensure that we deliver satisfying and life-changing results for our patients. The cost of anesthesia for a facelift can vary significantly for each patient. You want to make sure anesthesia is provided by a board-certified anesthesiologist or a CRNA (nurse anesthetist). If a surgeon uses a non-certified anesthetist nurse or a medical assistant to push the anesthetic drugs (and yes, unfortunately, this does happen), then your safety may be at risk. After calculating the cost of surgeon's fees, anesthesia, surgical facility fees and all other expenses, the cost of a facelift often reaches a total between $8,000 and $20,000, if not more. Many people don’t have this amount of money at their immediate disposal, but when the decision is made that it’s the right time to undergo the procedure, it becomes necessary to consider financing options. Practices almost always accept credit cards, but patients should carefully consider the associated interest rates of all available options. Also, there are several third-party financing companies that deal exclusively with those who want or need treatments that are not covered by insurance. While cost is obviously an important consideration when it comes to facelift surgery, it is not the most important one. Patients should remember that their health and cosmetic satisfaction are ultimately the top priorities. Choosing an inexperienced doctor to save some money could cost far more in the long run if they require a corrective procedure or if they develop serious health complications. The four board-certified surgeons at Austin-Weston Center are members of the American Society of Plastic Surgeons (ASPS), performing countless facelift procedures resulting in a revitalized look that appears natural and youthful. Our surgeons are dedicated to providing patients with the results they desire and the care and safety they deserve. To find out more about your plastic surgery options, please call (703) 893-6168 to schedule a free consultation.